Politics, Fashion and Stars are always a guarantee on and off the red carpet for the Academy Awards and this year was no exception. Before the ceremony, diversity was the big topic and now the day after, the discussion has continued regarding equal pay for women, rights for the LGBT community and like John Legend so eloquently pointed out in his speech,"...there are more black men incarcerated than there were slaves brought to America". Eloquent, provocative and jaw dropping speeches were definitely trending and given by winners Patricia Arquette, Common. John Legend and Graham Moore. Moore, who won for The Imitation Game dropped a bomb that detonated the Dolby Theatre, but his words were needed and heartfelt. "When I was 16 years old, I tried to kill myself because I felt weird and I felt different and I felt like I did not belong. And now I’m standing here and, so, I would like for this moment to be for that kid out there who feels like she’s weird or she’s different or she doesn’t fit in anywhere. Yes, you do. I promise you do. You do. Stay weird. Stay different. And then when it’s your turn and you are standing on this stage, please pass the same message to the next person who comes along." The stars showed up and showed out for the red carpet. The pale pallete was a popular hue worn by Viola Davis, Jennifer Lopez and Oprah Winfrey to name a few. My personal favorite was Gone Girl nominee Rosamund Pike in a red lace number that made her look like a lovely, statuesque bouquet of roses. I had the opportunity to chat and meet some of my media idols such as "Entertainment Guru" for LA ABC7 - George Pinnachio, my good girlfriend, supermodel Roshumba Williams and made new friends like kitsch queen Esther Goldberg and TrendyMii.com's Keira Renee (who really helped a sister out on the red carpet)! 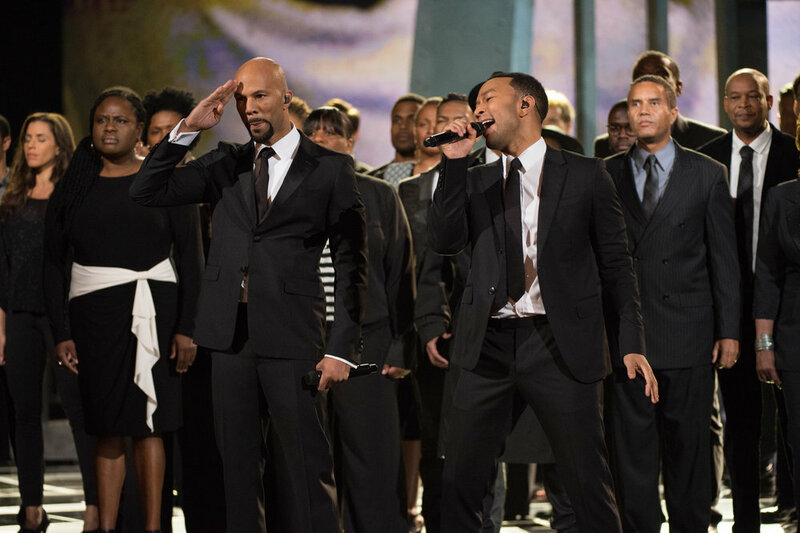 Common: "John and I got to go to Selma and perform “Glory” on the same bridge that Dr. King and the people of the civil rights movement marched on 50 years ago. This bridge was once a landmark of a divided nation but now is a symbol for change. The spirit of this bridge transcends race, gender, religion, sexual orientation and social status. The spirit of this bridge connects the kid from the South Side of Chicago dreaming of a better life to those in France standing up for their freedom of expression, to the people in Hong Kong protesting for democracy. This bridge was built on hope, welded with compassion and elevated by love for all human beings." John Stephens (John Legend): "Nina Simone said it’s an artist’s duty to reflect the times in which we live. We wrote this song for a film that was based on events that were 50 years ago but we say that Selma is now because the struggle for justice is right now. We know that the Voting Rights Act that they fought for 50 years ago is being compromised right now in this country today. We know that right now the struggle for freedom and justice is real. We live in the most incarcerated country in the world. There are more black men under correctional control today than were under slavery in 1850. When people are marching with our song, we want to tell you we are with you, we see you, we love you, and march on. God bless you." After the ceremony the stars partied till the sun came up. I joined my fellow AAFCA members at a soiree sponsored by our organization and Mercedes Benz at the Four Seasons. 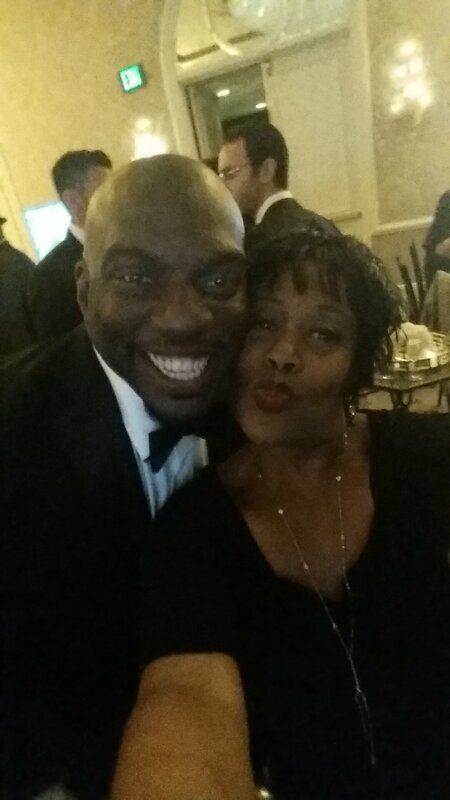 Black Hollywood was in full effect with numerous 'Selma" castmates including Niecy Nash and "my brother from another mother" Omar Dorsey. Other attendees included Colman Domingo, Sheryl Lee Ralph, Beverly Johnson, Robi Reed, Star Jones, Vanessa Bell-Calloway and many others. It was an exciting and exhilarating year for film that have inspired a lot of long overdue conversations. In moving forward, let's just not talk...but act. Make a Change...Make a Difference...Starting NOW!!! 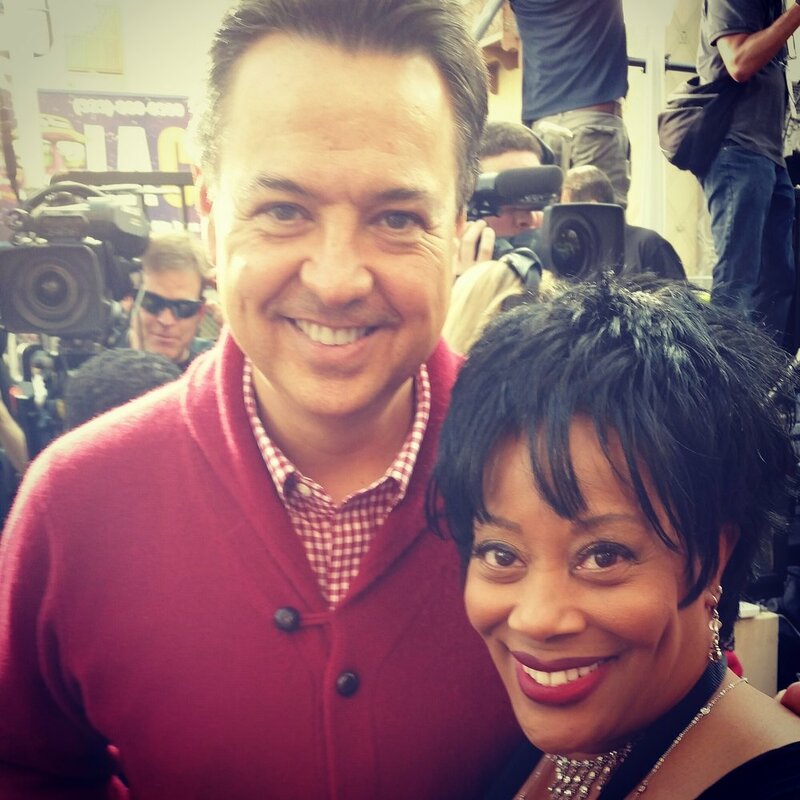 Check out my Pre-Oscar Red Carpet Coverage and see you next year!! !